As a class, we got to travel to Chuck E. Cheese to explore the gaming world. Because it was my first time at the arcade, I took it upon myself to be a big kid first and play some games before I came to focus on the assignment. You may have seen this game in some of our other classmates’ blogs. I chose Treasure Quest which was one of the games based on luck. The player will insert a token for a chance to spin. The goal of the game is to get the maximum number tickets possible. In this game, 100. With the help of the Professor’s counting technique, we came to figure out that there is only about a 1 in 50 chance of having the cursor land on the big prize. I played about 5-6 times and the most I got was 25 tickets. Hey! It’s better than 1. It is hard to suggest possible mechanic and rule changes to such a simplistic game. This is something I had a hard time with because I didn’t want to suggest some of the same rules my classmates came up with. Instead, I wanted to bring something new to the table. Look forward to me editing my post! I will think of something, something good hopefully! The game that i chose for Chuckie Cheese to modify was the wheel. My game is not a game that is solely based on the wheel itself but incorporates the wheel into the game. Where you see the numbers on the wheel i would instead have all different exercises for example (Bench Press, Plyometrics, 4 Mile Run ect.) All these exercises would have a different point value, I would also set up a large bulletin where i would have 3 diffrent columns listed as, Cardio Vasuclar Endurance, Muscular strength, Muscular Endurance. The students would have to spin the wheel and whatever exercise the pin landed on the student would have to take it off the wheel and post it in the column that best represents that exercise. I would explain to the students that and exercise might also have more than one benefit incorporating more than one aspect of physical Fitness but i would like them to chose the aspect that is more relevent. The more complexed the exercise the higher the point value it will be. The Students with the highest point value at the end would be the winner. This game will help students identify and learn what exercise helps improve what aspect of physical fitness. Our visit to Chuck E Cheese turned out to be lots of fun! By playing the games, I was able to get great ideas on creating educational games. I found a game called Sea Quaizy, that I thought was entertaining and simple to play. Although I enjoyed playing other games too, I chose this one to modify because it seemed like it could be a fun educational game as well. To play the game, you have to insert a coin in the slot. 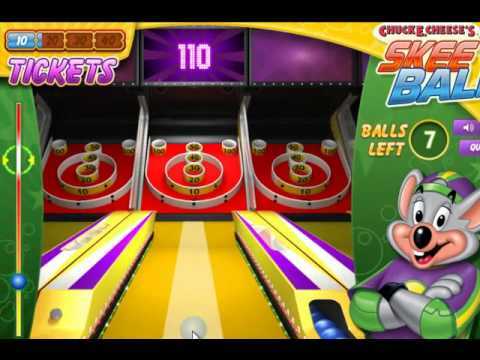 A small ball is elevated up by springed coils, after you press the button, the ball rolls down a ramp that guides it down to the bottom of the “sea”. As the ball makes its’ way down the ramp it starts spinning 3 starfish. The starfish have 5 different colored rays/arms. The player then proceeds to stop the starfish on the same colored rays/arms by pressing the button 3 times. At the bottom of the “sea” the ball passes underneath an octopus. The octopus has various point values on each of its 8 arms. Whatever point value lights up when the ball passes underneath an arm is the number of tickets awarded to the player. This game is based on luck and the outcome is random. I got LUCKY three times! My modification to Sea Quaizy will be geared towards 4th-5th graders. I’m not sure exactly how I will create this game…some ideas that I have are putting fractions (1/2, 1/4 etc.) on 1 spinning circle, on another circle put percentages of what the fractions equal (50%, 25% etc.) The goal of the game would be to match the fraction with the percent. I would divide my students into two equal groups and they will each have a turn at spinning the wheel. Whatever fraction the wheel lands on, the student has to tell me the percentage of that fraction. They will get 1 point if they answer correctly. Then they will have a try at spinning the percentage wheel, if it lands on the correct percentage of their fractions they get two more points. If they don’t give me the correct percentage answer after the first spin, they won’t get any points and the other team will have their turn. Since I plan on teaching children with special needs, it is known that they learn at a faster rate through visual queues and play. Children learn best through playing because fun activities help to increase their level of focus (an interesting article on learning through play). Trying to teach them fractions through a game will help them to memorize the percent of fractions. We spent Monday playing arcade games at Chuck E Cheese winning tickets and prizes. And taking notes about the mechanics and rules of a variety of games. Each student is to document the game play with photos and video and then describe the mechanics and rules. Also the students are to suggest possible mechanic and rule changes to make the game an educational game. I chose the Winners Wheel which was one of the slot games in which you time your token to cross a moving plank into the winners slot. Below is a video of the game, sadly I kept missing the planks! Once you do cross the plank into the winners slot, a ball pops out onto a track making a quick circle around the wheel and falling in. On the wheel are nine holes into which the ball may drop which corresponds to a ticket reward worth 6-26 tickets or the bonus slot which is defined on the display above (50 tickets when I played). I did notice that the hole for the bonus prize had a raised lip around the edge, making the likelihood that the ball would drop there practically zero. The wheel also appeared to not be spinning on a level surface as it did not just move to the outside edge and stay there as you would expect with centripetal force from the wheel spinning. The ball would roll across the middle from likely high to low spots of the angled wheel surface. I couldn’t tell if the lower surface was near lower ticket amounts but it wouldn’t surprise me. To apply some educational rules to the Winner’s Wheel you could have quiz questions allow a player to win tokens, which are then an opportunity to play. But that’s kind of an easy way out. I think it might be interesting to change the mechanics of the plank size based on a math game, particularly fractions and fraction addition. A player could ‘win’ a larger plank based on their ability to add, subtract, multiply, and/or divide fractions correctly. So for example the student starts with by default a plank that’s a 1/4 inch wide. They select at random another piece of plank they can add between 1/4 inch wide to 1 1/4 inch wide. A student selects a 2/3 inch piece of plank. The student must add 1/4 and 2/3 correctly to get the wider plank, which in turn would make it easier for the student to get the token across to the winner’s slot. The game I liked best (even though it wasn’t working properly) was the Football 2 Minute Drill. The mechanics of the game were pretty simple: put in token and game starts. A conveyor belt brings the footballs to you and you must toss the balls into 3 different sized holes. The smaller hole is more points. The game continues for 2 minutes. Question: what is 2 X 3? The student would then have to toss the ball in the hole designated “6”. If successful, they would score additional points for their team.